Correctly defining your keywords is a step of paramount importance in order to get the mention results you are interested in. Keep in mind that defining your keywords can narrow your mentions data. 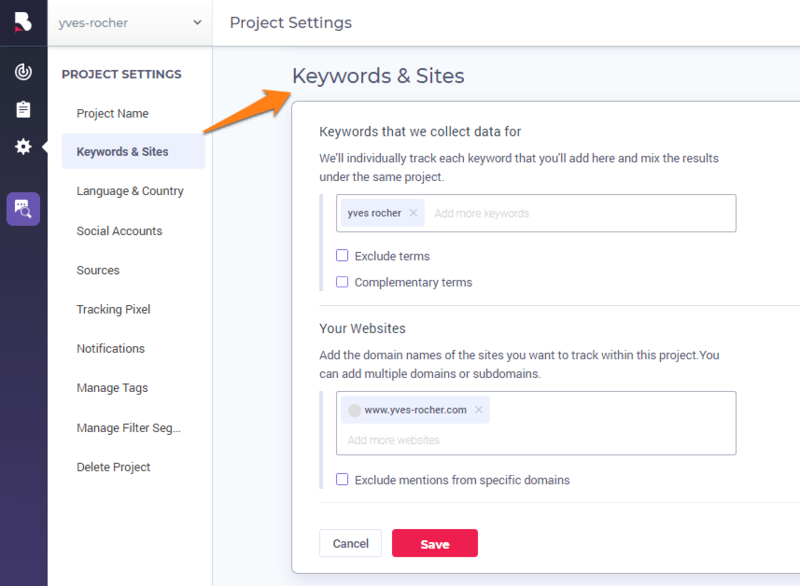 To add, refine or delete the keywords you are interested in receiving mentions for, go to the Project Settings, just like in the screenshot below. 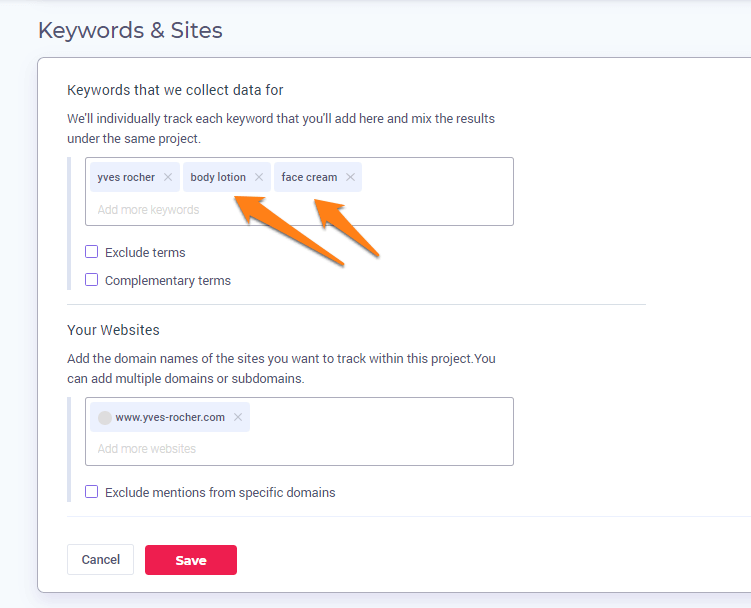 In this section, you can add all the keyword you want to track within your project. For a keyword to be tracked individually and added to the project, you must press enter (key). You can add the brand name and variations of it, the domain name , your own name and other keywords that might be relevant to you. For instance, if you’ve running a promotional campaign you can track the name of the campaign, or if you’re promoting a new product release, you can track the name of the product and so on. It’s up to you. 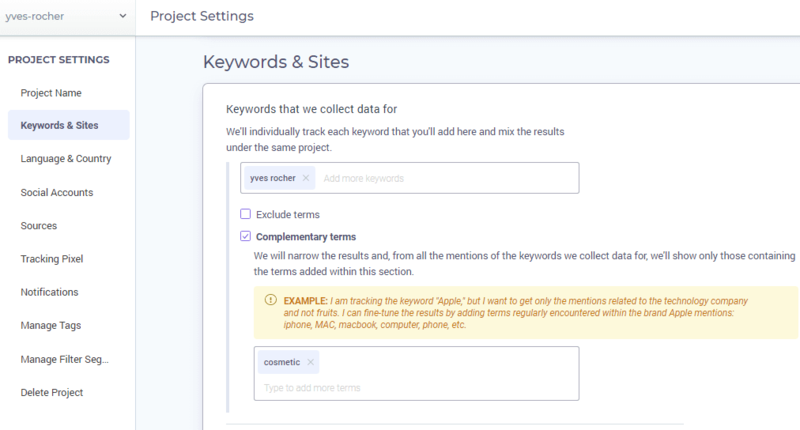 We’ll individually track each keyword that you’ll add here and mix the results under the same project. Add here the keywords you don’t want to receive mentions for. Let’s say you are monitoring the brand is Yves Rocher and you don’t want to receive any mentions related to bags or clothing. You should add here the terms: “clothing”, “bags”. After each added term, hit enter. On the same note, you can narrow your mention data even more, using the complementary keywords option. This feature offers you the possibility to refine your monitoring, so that you will receive only the mentions containing a specific set of keywords. For instance, if you are tracking the brand Yves Rocher but you are interested in receiving only the mentions related to cosmetics, add here the term “cosmetics”. This way, from the total of mentions that we are monitoring for the brand Yves Rocher, we will show you only those containing the keyword “cosmetic”. Both excluded and complementary terms features should be used carefully. When used accurately they can bring great results as you’ll receive the exact mentions you are interested in; yet, if used inaccurately they can exclude from your analysis relevant mentions for you.